L-R: Stephan Krenz, CEO Abellio; Bert Groenewegen, CFO Nederlandse Spoorwegen; Thea de Vries, Department Infrastructure and Environment Netherlands; MP Martin Burkert, chairman of the Federal Transport Committee; Conny Bieze, member of the executive council of the Province of Gelderland; Martin Huesmann, VRR; Claudia van Veen, presenter; Geert Ritsema, Arnhem; and Ronald RF Lünser , chairman board Abellio Rail NRW. Credit: Abellio. Abellio has officially opened a cross-border train service from Dusseldorf, Germany, to Arnhem, the Netherlands. Celebrating the expansion of the RE 19 line in its Lower Rhine network, Abellio Rail NRW chief executive Ronald Lünser said it was “a milestone in the history of regional transport in North Rhine-Westphalia and the province of Gelderland”. Starting from Arnhem Central, the service will take passengers directly to Düsseldorf Airport. The new connection will offer passengers hourly direct services between German Rhineland and Ruhr regions and the Netherlands. When operations began in December 2016, the RE 19 line initially only ran between Düsseldorf and Emmerich but, following the expansion, it will now run to Zevenaar and Arnhem. Since the beginning of work in the Lower Rhine network, Abellio has created approximately 85 jobs and built a new workshop for servicing trains in Duisburg, which opened on March 3, with €15 million invested in maintenance technology. 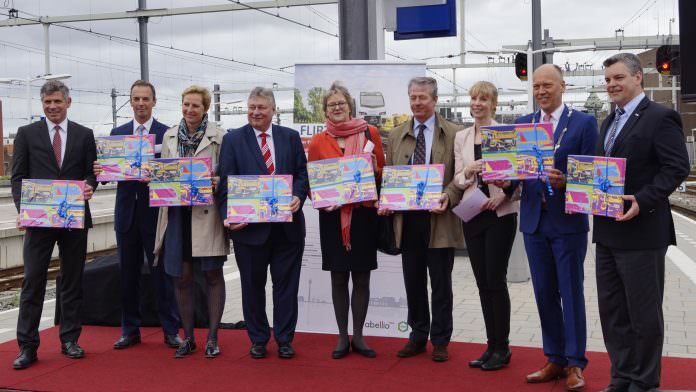 Marking the occasion, Abellio, which has been commissioned by the Province of Gelderland Verkehrsverbund Rhein-Ruhr, organised a celebratory service in a new Stadler FLIRT EMU. The first cross-border train travelled from Duisburg to Arnhem via Wesel on April 6. It crossed the border later than expected at 12:25 as a result of technical difficulties with integrating the three different automatic train control (ATC) systems required for cross-border operation. Ronald R.F. Lünser, chief executive of Abellio Rail NRW, said: “Today we celebrate not only a milestone in the history of regional transport in North Rhine-Westphalia and the province of Gelderland, but also a memorable moment for us as Abellio Rail NRW. Martin Husmann, chief executive of the Verkehrsverbund Rhein-Ruhr (VRR), the public transport association covering the area of the Rhine-Ruhr area, said: “The new cross-border regional railway line connects over two million people in Gelderland with the more than 17 million people living in North Rhine-Westphalia. Providing the residents of both regions with clearly more comfortable options for commuter travel and for onward travel to other destinations. But try booking a ticket online. It’s impossible!